Recently I was tasked with a project of moving a dinette chandelier location over a few feet. Our kitchen area is not that large and so my wife and I decided that we didn’t want another chandelier over the table to clash with what we have over our new island. Instead of a chandelier we decided to install 2 recessed cans. You can see in this photo above the original location of the chandelier junction box. It’s just too close to the island (out of the photo on the right), and not over where we would like our table to be. I will be cutting in 2 recessed can lights to shine on the table. I had these installed and working for about a month and decided I didn’t like them for this purpose. First reason was the color of the led light. These are a 3000k color and the rest of the trims in my kitchen are 2700k, a little warmer. I just didn’t like the color difference between the two. The other reason was the glare. 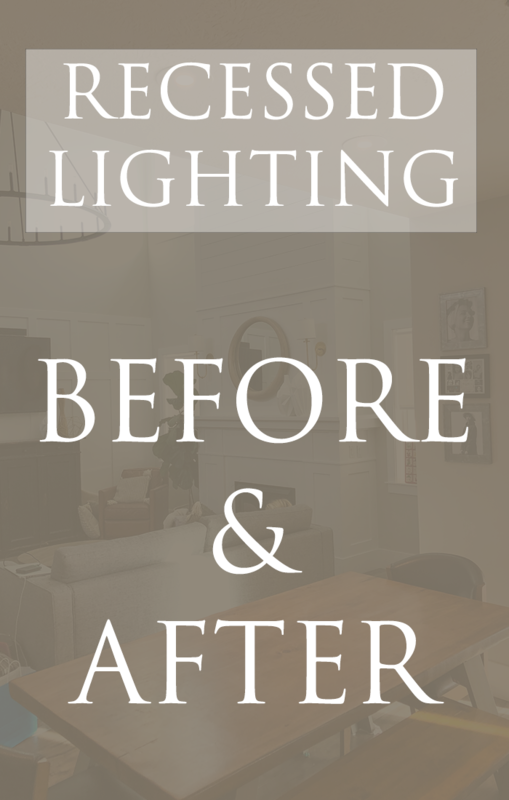 This picture below shows the difference of the new trim I installed vs. the led trim I originally had there. The trim on the right is the led. It’s pretty bright and has a lot of glare to it. The following photos are the process of installing the new cans and trims. I had to order 2 remodel shallow recessed cans, in order to use the trims I wanted, and also to fit under the pipes in the ceiling. The shallow recessed cans are only 5 1/2″ tall vs 7″ for the standard can. Wiring is easy with the built in connectors that come with all recessed cans now. Just strip off a bit of the jacket and stick them in to the correct connector. You can see my 6″ hole above in the sheet rock. This is the recessed can installed. You can see the little tab inside the can. Once the can is pushed up in the ceiling you push those tabs out and up to get them to lock in place. Here is a photo of the trim before it’s installed in the can. This particular trim is called a “Pin Hole” and it uses a 50 watt GU10 light bulb. It’s 120V so you don’t need a transformer up inside the can or a low voltage can. Here is the trim installed. I love these trims because of the very small opening. They do a really good job of “shooting” the light down to where you want it, without all the extra glare on the ceiling in your line of sight. There is another trim I love called a “slot” trim. I will be changing out some trims in my kitchen to these and will do an update with them as well. The two photos above show the recessed cans on and off. You can see how nicely the pin hole trims direct the light right on to the table with not a lot of glare from above. Hope you find this article helpful in some way. Please reach out to us if you have any question about this project or anything else lighting related, we would love to help! Next Next post: Office Desk Lamps With USB Charging!